When the Tampa Bay Rays selected Drew Vettleson in the 1st round of the 2010 MLB Draft they selected a truly unique player coming out of high school. Not only did Vettleson excel at switch hitting but he was one of the very few athletes that could also pitch from both sides of the mound. Favorite Player Growing Up: Ken Griffey Jr. When the Tampa Bay Rays selected Drew Vettleson in the 1st round of the 2010 MLB Draft they selected a truly unique player coming out of high school. Not only did Vettleson excel at as a switch hitter but he was one of the very few athletes that could also pitch from both sides of the mound. The Rays are developing him as a switch hitting outfielder but before we jump ahead to the present lets look back at Vettleson’s life before the draft as a player who could truly do it all. In high school, Vettleson led Central Kitsap (Silverdale, Washington) in every offensive category during the 2010 season. As a batter he hit .490 to go with seven home runs and 29 RBI. On the mound he was the team’s ace, finishing the season with a 1.35 ERA and 71 strikeouts. As a pitcher Vettleson featured a fastball, change-up and a knuckle curve. What made Vettleson stand out on the mound however was that he could throw all three pitches not only right handed but left handed as well. As a right hander his fastball could hit the low 90’s. When he turned to the other side of the mound as a lefty, he could still throw his fastball in the low 80’s. He was able to throw all three pitches for strikes and during games would switch from right to left as the game or situation dictated it. There are few athletes in the history of the game of baseball who have been able to do this. Greg A. Harris is the only major league pitcher in the modern era to pitch with both his left and his right arm. He did so as a member of the Montreal Expos during the 1995 season. Besides Vettleson, another prospect Pat Venditte, whom is in the New York Yankees system also pitches with both arms. Venditte even uses a special modified glove that allows him to switch it to whatever hand it needs to be on depending on who the batter is at the plate. Tampa Bay however did not draft Vettleson for his pitching skills. They drafted him because scouts liked his bat and his ability to hit successfully from both sides of the batters box. When Tampa selected the slugger he had committed to playing baseball at Oregon State University, which is known for having a top notch baseball program. It came down to the wire but it has been reported that when Vettleson officially signed a deal with the Rays it including an 845,000 dollar signing bonus. Since the slugger signed so late in the draft signing period he did not get a chance to get on the field with any of the Rays affiliates in 2010. The 2011 season would mark Vettleson first full season in the organization. To start 2011, Vettleson saw time in extended spring training playing in games and working on improving his skills as he transitioned from the speed of high school to the faster paced environment of professional baseball. 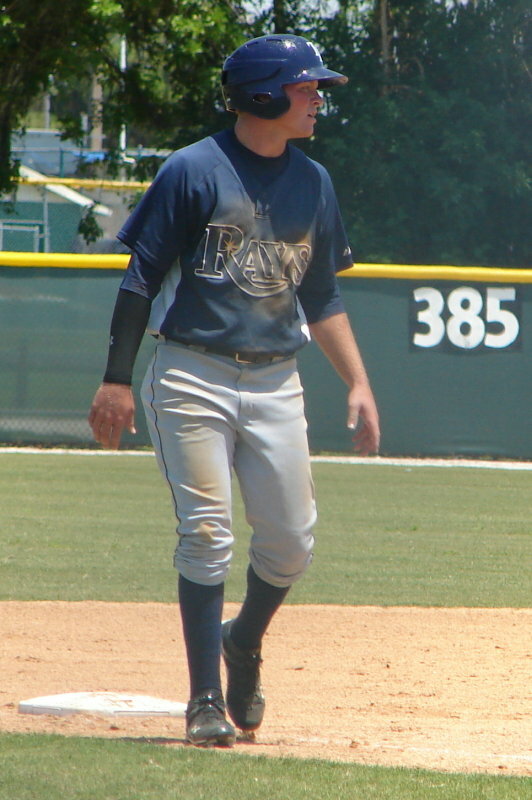 In June, Vettleson was assigned to the Princeton Rays, who are located in West Virginia. With the Rays, Vettleson showed off his hitting skills right off the bat. For the season he battled .282 with seven homeruns, 40 RBI’s and an .819 OPS. Very impressive numbers considering Vettleson appeared to wear down in the final month of the season and only battled .191. With a year under his belt and an off season to prepare, Vettleson is focused on his conditioning so he prevents wearing down like he did his rookie season. As 2011 came to a close, Vettleson picked up some major accolades for his potential talents. Baseball America named Vettleson the best hitter for average in the entire Rays system. The publication also ranked him as the 9th best prospect in the talented organization. Vettleson has been in the top ten on numerous other lists for Tampa Bay prospects as well. As 2012 approaches Vettleson hopes to improve all facets of his game. He wants to continue to prove that his bat is a threat from both sides of the plate but also wants to improve his defense and base running. With the help of The Rays coaches and instructors Vettleson should be able to do this as Tampa Bay has shown that it has a system that can develop talent and turn them into important pieces on the big league roster. We will continue to follow his progression throughout 2012. You can follow Drew on Twitter at @DrewVettleson and you can follow us on Twitter at @CTD_Sypien. What was it like to be drafted? What were you doing when you found out you were selected? Being drafted was an unreal feeling. Going through the process was something no one can ever be prepared for. I was taking calls everyday and basically doing all I could do to make sure I was putting myself in the best spot I could come draft day. That 4 months of the high school season was crazy but at the same time I enjoyed every second of having scouts come watch and being able to perform with a little added pressure. The day I was drafted was the day I realized if you put the work in and stay focused you can achieve the dreams and goals you set out for yourself. It was great experiencing that day with my friends and family. We were all at my house from the first pick until the 42nd where I was taken. Last season was your first in pro-ball. What was the hardest about transitioning from high school to pro-ball? The hardest part about the transition from high school to pro ball was the grind of playing everyday. I look back at my first season and I had times where I felt I couldn’t be stopped I was just in the zone and then there where other times where I just didn’t know what i was doing and dealing with struggles I had never experienced before was difficult. Looking at it now im glad I was able to experience both sides because baseball at this level everyone going to have their ups and downs it’s the ones that can cope with the downs and minimize them are the ones who are going to make it. Also going into the season I didn’t know how to get my body ready I didn’t know what i was getting myself into and as the season went on my body started to fall apart. That has been my main focus this offseason is to really prepare my body so not only can I have a good start but finish the season strong too. What is your biggest strength in your game? My biggest strength in my game is hitting. I feel ive been pretty good at making adjustments and being open to advise that will help me get up to speed with pro ball. I’d say I can hit the ball well to all fields and have pretty good gap power and as my body developes and I get strong I hope to show more power and be the most complete hitter I can possibly be. On the flip side what is the thing you need to work on the most? Going into my first season I knew being apart of the rays system I really needed to devote my time to being a better defender and better base runner. In high school all I focused on was hitting but being around the minor league coaches and listening to what they had to say I knew I had to really try to make those strong points in my game if I wanted to make it to the big leagues. I felt I did a pretty good job paying attention to the details in those aspects and carried it to the game. Going into this season I want to build on the things I learned in my first season and become a great outfielder and someone other teams have to watch out for on the base paths. The Rays are widely known for being a great organization at developing players. Is there anything in particular that they preach to young players at the level you played at last season? The rays really preached to us young players that were the guys they want to see on their big league team. It shows on how much effort the coaches and coordinators put into us each day to make us better. The rays don’t go looking for the all-stars from other teams they put their time into trying to develop their own guys and its a great feeling being apart of that. Have The Rays told you where you may start next season at or will you find out once minor league camp is over? We wont know where were going until the end of spring training. In high school after the season is over there are various travel or season leagues in which you can get more innings and at-bats. Transitioning to Pro-Ball what did you do this offseason to stay in shape and keep your skills sharp? This off season I’ve been really devoting all my time to the gym trying to get my body ready for this season. I hit a wall last year going in august and one of my main goals this year is to be more consistent and being in shape will allow me to deal with the grind and finish this up coming year strong. Who were your favorite players growing up? Favorite non-baseball athlete? My favorite baseball player is Ken Griffey Jr. Non baseball athlete Kevin Durant. PS3 Wii or Xbox? Favorite Game or Games? A special thanks to Drew Vettleson for taking some time out of his off-season schedule to sit down and talk a little baseball with us. Once again please give him a follow at @DrewVettleson and follow us at @CTD_Sypien as we follow Drew and others during the 2012 season.